Here, you be the Flower Girl! Little known fact: I have been a Flower Girl in a wedding. There. I said it. Now the world knows my gender-bending little secret. You may think it took years of therapy to reach this moment of soul-bearing confession. Perhaps it should have. Bitter, you ask? Well, HELL yeah I’m bitter…but not for the reason you might think. Please…if you plan to read on, pick yourself up off the floor and QUIT laughing!! It’s not what you think, really…it’s not…and just wipe that vision from the white board that is your brain of me tra-la-la-ing down the aisle of the church in layers of tulle, satin sashes and black patent MaryJane’s flicking rose petals into the air. Yes, it does paint a picture worthy of decades on Dr. Freud’s couch. 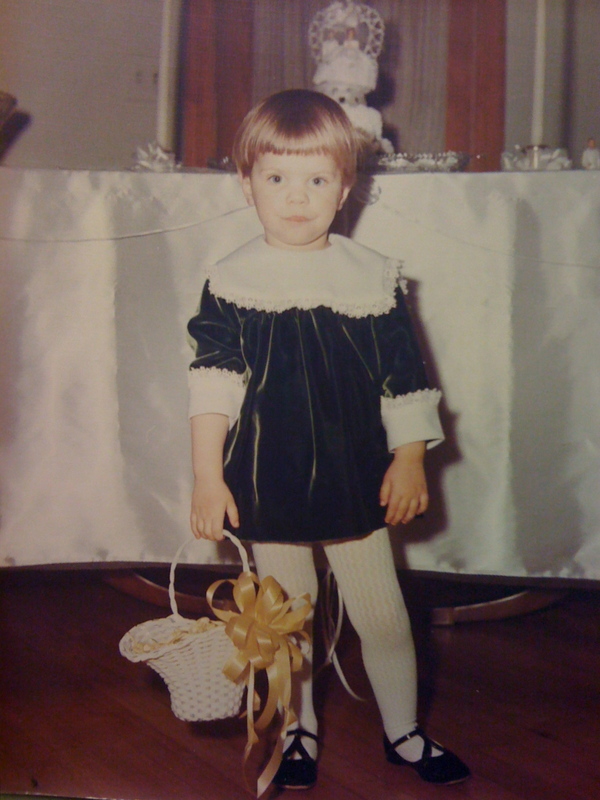 (Or maybe it should have… Such as it was, being a flower girl wasn’t such a bad gig. Perchance I should elaborate. Way back when, I believe the year was 1967, my Aunt Connie and Uncle Fred announced their upcoming nuptials. The big date was on New Year’s Eve! As Connie’s only nephew and niece, we were given the most important jobs of Ring Bearer (me) and flower girl (my sister, Amy) for the momentous affair. As a young tot barely four years old, this big family event called a wedding was a first for me, and as I could quickly tell was going to be right up my alley! New, fancy dress up clothes with a bow tie? OH yeah! A frilly pillow, complete with his and her JEWELRY attached?!? OH yeah! A slow walk down the aisle to the wafting notes of Wagner’s Bridal Chorus with EVERYONE who was ANYONE (in our family anyway) watching my every move?!? OH YEAH!!!! I mean, what could be better?? I was to be The Ring Bearer! Bearer of the Rings! From what I was hearing, they couldn’t get married without the rings, so they couldn’t even HAVE this big Hoo-Ha without me!! Ah yes…life was good!! Four years old, and the entrusting of the marital rings rested on my frilly pillow! Had the story played out as originally written, we would not be here today, me recounting a duty that should have been, you walking me through the sad tale that should have been told on a therapist’s couch… But hey, you’ve made it this far, and I would like to think you have a flicker of interest in how this sordid tale unwinds. For weeks, I practiced my unwavering glide down the church aisle. I was to make sure that no rising in the carpet or unsuspecting pebble brought in by wayward shoe would mar the ascent of the marital rings to the high altar, nestled as they were sure to be atop my satiny, frilly pillow of great importance. Prepared! I would be prepared!! As wedding day neared, I watched in awe as the hustle bustle of what was known as a wedding swirled all around me! Unfamiliar vocabulary became my lexicon of choice: ‘Showers’ delivered gifts of china and crystal, and not necessarily in the rain. ‘Reception’ meant lacy tablecloths with a tiny bride and groom waiting to preside over a big fancy cake, and had nothing to do with television antenna. ‘Matron of Honor’ meant my Mother in a special velvet dress with shoes dyed to match. ‘Sad’ meant my Grandfather, not wanting his youngest daughter to leave the nest. ‘Flower girl’ meant my sister, sprinkling flower petals down the aisle in preparation for my Aunt Connie, THE BRIDE. ‘Velvet’ meant my new favorite fabric, soft and fleecy to the touch. ‘Ring Bearer’ meant ME! On the morning of the wedding, I remember my Aunt Connie calling out to my Granny, “Where is my Train? ?” Good Lord, I thought! There is even going to be a TRAIN to take her to the church, and it’s not that far away! These weddings are big time stuff!!! Before we knew it, all the family was off to the church for the event of a lifetime! It surely seemed that way to a four year old! My sister, Amy was two years old, and hadn’t had much to say in all the ‘Rinktum’ we had been experiencing. ‘Rinktum’ was my Granny’s word for craziness that would erupt around big events like weddings, cemetery decorations and the like. Amy apparently didn’t like ‘Rinktum,’ though no one knew until it was just a bit too late. Waiting at the back of the church, music began to play. I watched as each Bridesmaid walked slowly down the church aisle. My mother, The Matron of Honor, walked down the aisle last. The place where my Mama was standing was the destination for me, the Bearer of the rings, and my sister, the petal pusher. A lady who was serving as the Director of this shindig, handed me the pillow I had been longing to hold for weeks. “Excuse me,” I asked the lady. “Where are the rings? There are supposed to be rings on this pillow!,” I implored. The lady bluntly replied, “The Ring Bearer pillow is just for show. The actual rings are with the Best Man. They would fall off the pillow if you were carrying them. Just hold the pillow and go when I tell you.” Fall off the pillow?!? I THINK NOT!!! Lady with a bad attitude had not seen me practice gliding down the aisle, rings nestled securely atop the Frilly pillow…which wasn’t too frilly of a pillow after all…yet another disappointment of this ‘Just for Show’ duty. Not knowing what to think, I clutched the basket and with a push from behind, Lady with a bad attitude propelled this Ring Bearer turned Flower Girl down the aisle. With what I am sure was a shot-out-of-a-cannon look on my face, and a frightened, confused smile at best. I walked…scratch that…I glided down the aisle dropping yellow chrysanthemum petals until I reached my destination: standing next to my Mama, in her special velvet dress, with shoes dyed to match. Epilogue: Now for the bitterness. A detailed newspaper article was to follow this event, as was the tradition for all southern weddings of note. This being the Mayor’s daughter wed, every detail would be noted, from the Bride riding in on a train, to the harried last moment transfer of roles from the distraught Flower Girl to her trusted understudy, the Bearer of the Phantom Rings. Local townsfolk would be abuzz for weeks over the pomp and pageantry woven by the Lady with a bad attitude at the Bethlehem East Baptist Church on New Year’s Eve. In that newspaper article, the list of wedding participants noted each Bridesmaid, Groomsman, Officiant and parental relation. Then came the icing on my multi-tiered cake of discontent: Listed as Flower Girl, Amy Leigh Creel. She of the last minute ‘I’ll-show-them” stint. She of not scattering even ONE teensy flower petal. She of stealing my big ring bearing moment…sort of. The Ring Bearer? Nada. Not mentioned as existing. Omitted. Left off the list. Given the frilly pillow shaft. I mean, if I was going to be the Flower Girl, shouldn’t I have been noted as such? I certainly thought so. Bitter? You’re DAMN RIGHT I was bitter!!! Perhaps some thought it was doing me a favor of sorts, this gender role-swap, before gender role-swapping was the hip thing to do. Perhaps, in some southern non-genderbending circles, it was. Be that as it may, I WAS THE FLOWER GIRL, THANK YOU VERY MUCH! 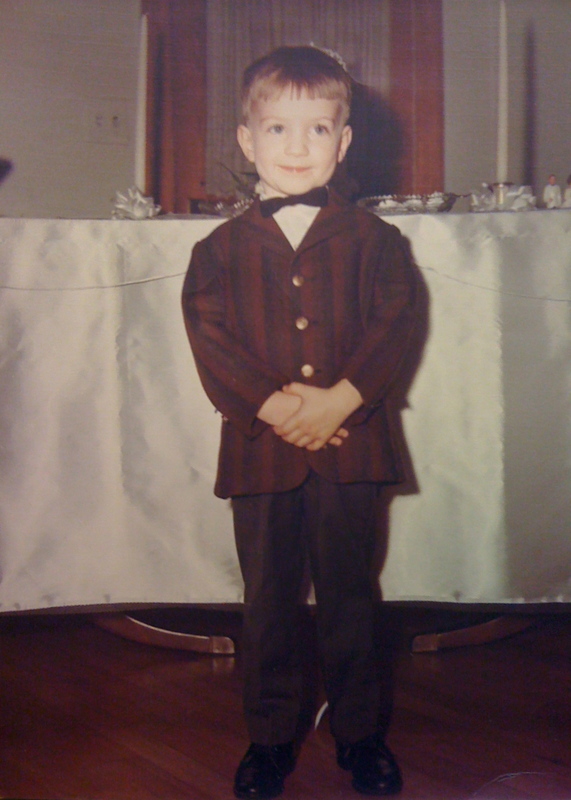 I held my head high, proud for saving the day and I walked…scratch that…I glided like a big boy to claim my post of honor…right next to my Mama, in her special velvet dress with shoes dyed to match. ← Decisions, decisions…what should I write about next? ?